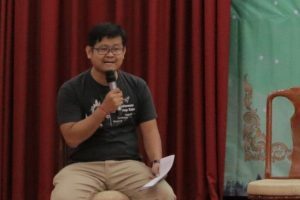 Open Institute (OI) facilitated and moderated the session speaking on the topic of “Meet up Best ICT projects in Cambodia 2017: Share Their Problems, Solutions and Challenges”, which involved best innovative projects that have been developed contributing to social developments in Cambodia. The session was taken place on the 21st of October, 2017 at the Institute of Technology of Cambodia (ITC) in the framework of the BarCamp ASEAN in Phnom Penh, 2017, which have attended by more than 150 participants of government officials, CSOs staffs, private sectors, and students. The sharing session was part of the ICT4D Cambodia Network projects funded by the Swedish Programme on ICT for Developing Region (SPIDER). Mr. Kheng Piseth, Executive Director of the OI, and the moderator, first introduced the important session brought best innovation ICT projects in 2017 which was not easy get all of them together at the right time to share experiences and challenges of using technology to solve social and community needs. He also raised some crucial data illustrating the significant increase of phone penetration in Cambodia consisted of more than 96% own their phone and among those 38% were smart phone users according to the research study conducted by the OI in 2016. So that, there have been increasing of investments to invest in the technology sector that will help promote of the communication technology development in Cambodia in a better future.